Spend any length of time living in Vancouver and you know it is constantly changing (old buildings come down, new buildings go up). Vancouver is a city in flux. For a relatively young city (in the global scheme of things), Vancouver has certainly gone through its fair share of changes in its 129 year history. Personally, I am amazed how quickly one can get used to the new scenery and forget what used to be there before. In my own experience, that is just in the past 40 years. Imagine how much the city would have appeared to have changed for people who lived here 80 or 100 years ago – it would be almost unrecognizable to them. 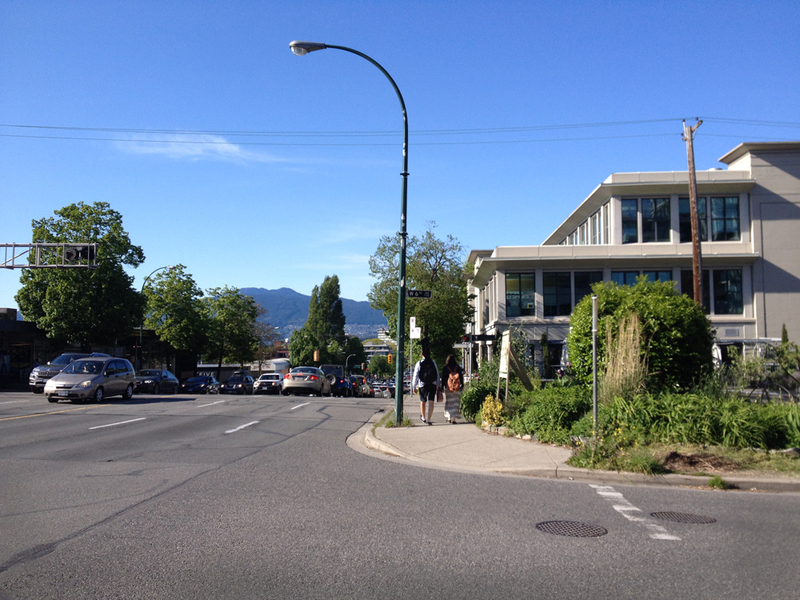 Here is a brief snapshot look at one part of that flux – Cedar Street aka Burrard Street. 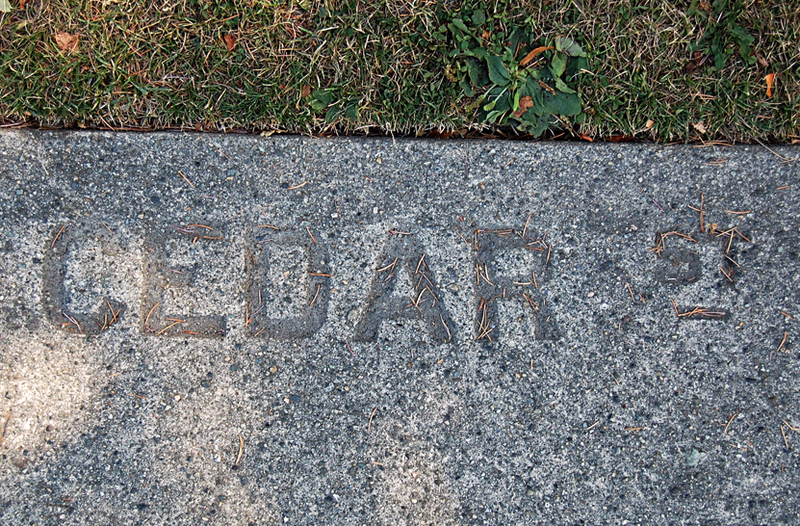 This sidewalk stamp reveals the former name of the southern portion of Burrard Street in Vancouver. According to “Street Names of Vancouver” by Elizabeth Walker, Cedar Street dates back to 1885 and was named by L. A. Hamilton, Vancouver’s most influential street namer. When the Burrard Bridge was completed in 1932, Burrard St. (north side, downtown) was then linked to Cedar St. on the south end of the bridge. Cedar Street was officially renamed Burrard Street in 1938. 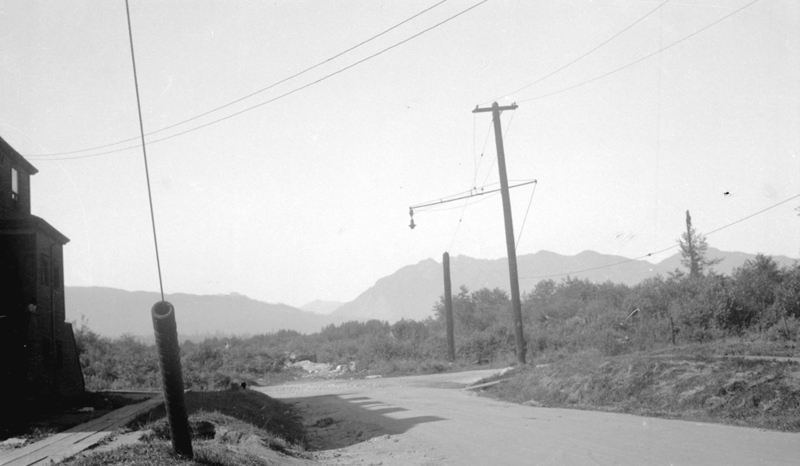 Looking northwest towards the intersection of Cornwall Avenue and Cedar Street (Burrard Street), July 193[2?]. Photo: Stuart Thomson, COV Archives – CVA 99-4630. The addition of the Burrard Bridge in 1932 dramatically changed this part of the city, and eventually Cedar Street permanently. 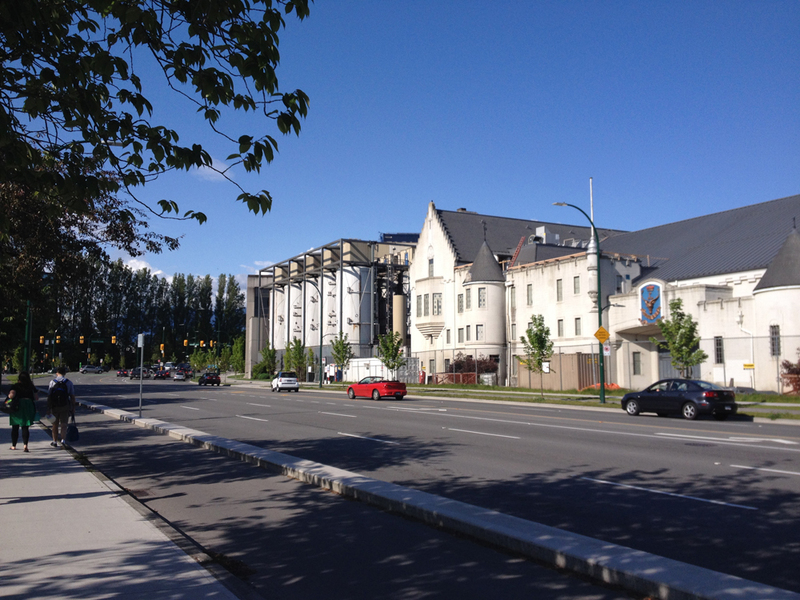 As seen in the photo above, this part of Cedar Street from the southern end of the Burrard Bridge to 1st Avenue was mainly undeveloped, scrubby land – no Molson’s Brewery complex (originally Sick’s Capilano Brewery – 1953) or Seaforth Armoury (1936) to be seen. In the photographs below, I was amazed to see how rural and simple Cedar Street (Burrard St.) looked before the Burrard Bridge was built. 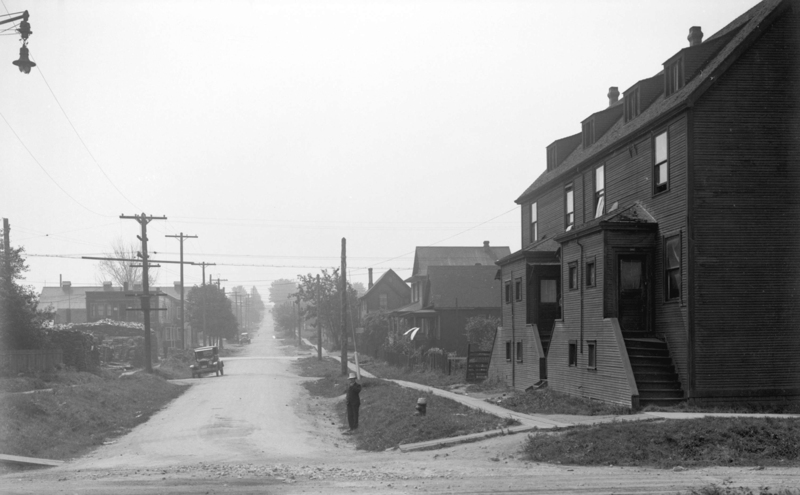 These are two views of Cedar Street at approximately 1st Avenue – one looking north, the other looking south. 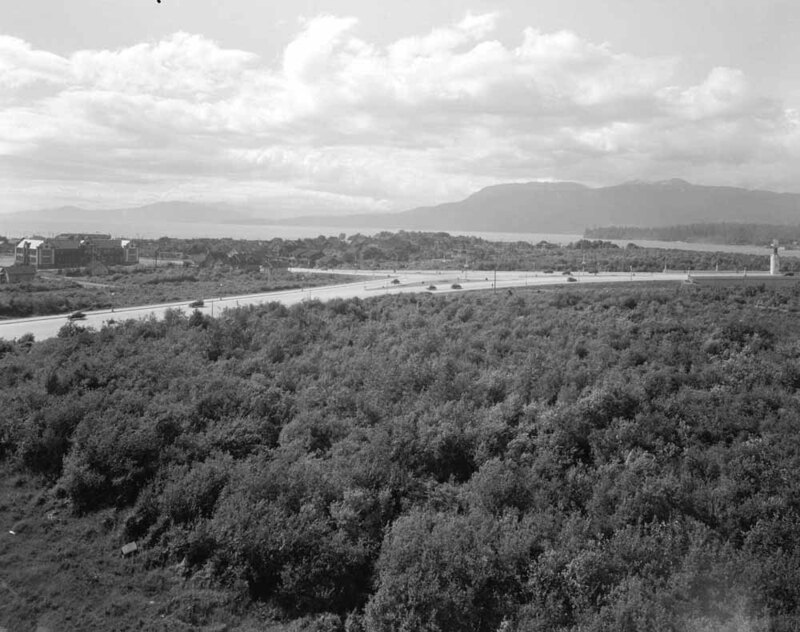 Though they are both dated 1931, they clearly show an earlier time (perhaps by only a year or two) before the Burrard Bridge was completed in 1932. By that time Cedar Street was widened and paved and concrete sidewalks were added to accommodate the increase in traffic along this route. J.S. Matthews standing on Cedar Street (Burrard Street) at 1st Avenue, looking south, Aug. ca. . Photo: COV Archives – SGN 419. 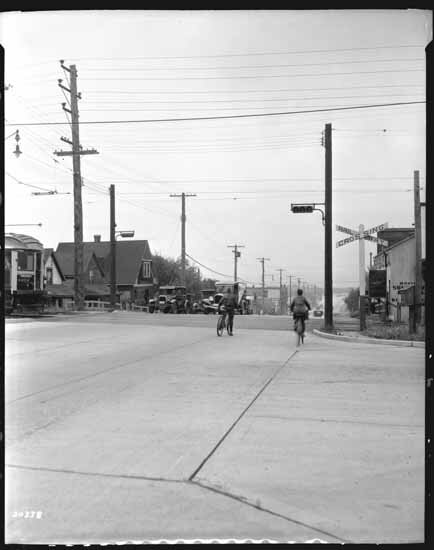 The photo below, dated 1934, shows how quickly the intersection of Cedar (Burrard) at 1st changed compared to the earlier photo above. If you look closely, you can see the same peak roof house on the right side of the photo (at approximately 2nd Ave.) in both images. Looking south along Cedar Street (approaching 1st Ave.). An Imperial Oil gas station is on the right, 1934 . Photo: Stuart Thomson, COV Archives – CVA 99-4632. Below, is the same intersection (Burrard at 1st Ave) today. It is interesting to note the continued presence of a gas station in approximately the same spot along Cedar/Burrard street. 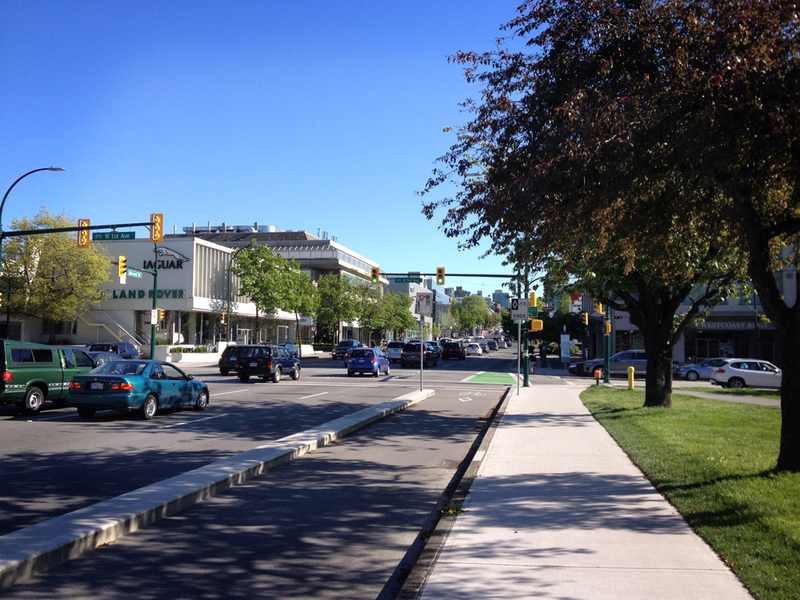 Below are two views of Cedar/Burrard St. at 6th Avenue, 70 years apart. The rail crossing and tracks are front and centre in the earlier photo. Whereas, they are just a memory in the 2015 photo and the lushness of the community garden is now the main focus. Cedar (Burrard) and 6th Avenue railroad crossing, July 1934. Photo: Dominion Photo Co., VPL Special Collections, 23563. One thing I noticed in all the 2015 photos, compared to the earlier photos, is how the hard edges of the built environment have been softened by the street landscaping. They add natural character to the city. Check out The benefit of Trees from Quiet Nature to see why trees are so important to the urban landscape. I hope to make The City in Flux: a semi-regular feature on Vanalogue. Look for more snapshot looks at different parts of the city in future posts. Fun Fact: The tree streets were intended to be laid out in alphabetical order, as L.A. Hamilton planned. However, a clerical error changed those intentions permanently. Who knows what tree street Cedar Street was initially intended to be called? Interesting, C. Hagemoen. 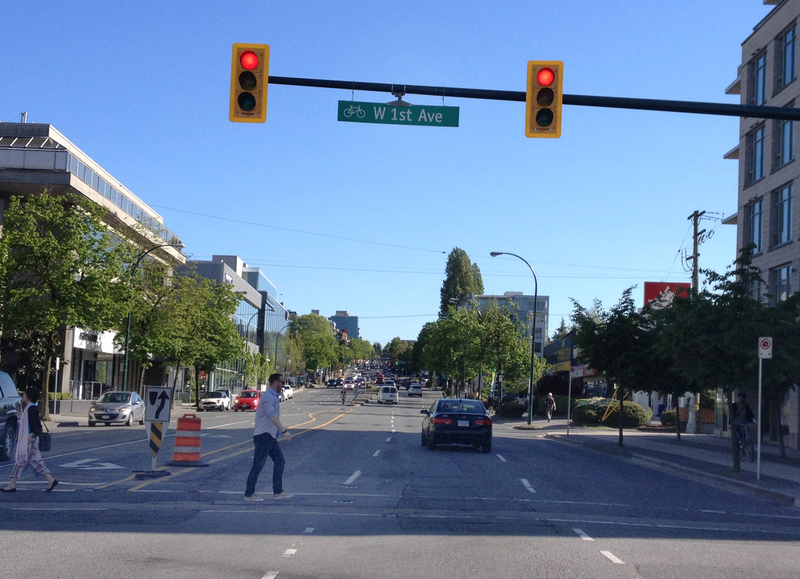 One thing I noticed in the last shot of Burrard & 6th is that most of the overhead wires are gone. Nice – especially with the noted addition of trees. Yes, I know what you mean, Sophie. But wires had a certain charm too. Or maybe that’s just nostalgia. But trees certainly. I wonder are they native BC trees? I don’t know my trees well enough to identify them. Thank you for identifying from which Avenue the Cedar Street from 1st Avenue picture was taken. I landed here through Google reverse image search and I was puzzling as to whether that really was 2nd Avenue at the nearest corner, with an earlier gas station where the PetroCan stands, now. I’m a fan of older buildings and think most of more newly built Vancouver is architecturally awful, but the same can’t be said of the street landscaping. Today’s greenery (and fewer prominent utility poles and wires) makes the streets much lovelier, especially when the trees are in leaf. Thanks Elaine. Isn’t Google fun? You never know where you may end up! I agree, street landscaping makes all the difference.